The low profile Terry Goddard has kept since becoming a candidate for governor came to an end as the Democratic attorney general publicly announced his third gubernatorial campaign. 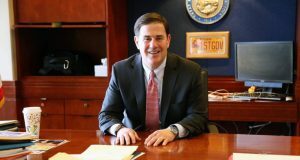 Speaking alongside dozens of supporters in front of the Attorney General’s Office, Goddard said April 5 that the state would be able to solve its budget problems by ending billions of dollars in exemptions and loopholes in Arizona’s sales tax laws. Those fixes, he said, could balance the state budget while restoring education and health care funding. “We have a whole set of revenue options that have not been considered,” Goddard said as he kicked off a statewide campaign tour that includes seven stops after Phoenix. Those proposed budget fixes are the first glimpse into the candidate’s fiscal policies, as Goddard has for more than a year — as the presumptive Democratic candidate — mostly refused to answer questions about which kinds of policies he would pursue as governor. He also has refused to put forth a detailed budget plan. “This is the beginning of my active campaign,” said Goddard, who created an exploratory committee in November and officially filed as a gubernatorial candidate in January. Goddard emphasized job creation, education, bipartisanship and his record as the state’s top law-enforcement official. “As your governor, I will fight every day to get Arizona working again,” Goddard said, stressing the main theme of his announcement. Goddard said he would not offer a budget plan to counter the one recently passed by the Legislature, but said the state could close its budget gap and provide money for education, health care, Science Foundation Arizona and other areas by eliminating sales tax exemptions. The exemptions, a frequent target of Democrats’ ire, include sales tax breaks for things such as country club memberships and elective cosmetic surgery. 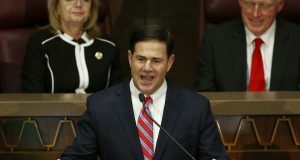 Goddard also suggested that Arizona may not be able to afford its extensive tax credit program for school tuition organizations, a favorite of Republicans. Much of Goddard’s announcement involved what he called the shortsighted actions and partisan legislative strategy of Brewer, whom he will face in the November election if she wins the Republican primary. He blamed Brewer for partisan “gridlock at the state Capitol,” accusing of her of negotiating exclusively with Republican lawmakers. Brewer has been under fire for the past year over her budget proposals, taking flack from the right over the temporary one-cent sales tax for which she’s advocated and from the left for deep cuts to education and health care funding. But she has challenged other gubernatorial candidates, on both sides of the aisle, to present their own proposals if they don’t like hers. Brewer campaign spokesman Doug Cole called Goddard’s proposals on tax exemptions “nickel and dime” ideas, and said the attorney general should present a written plan identifying which exemptions he would get rid of and how much money each would generate. Cole also accused Goddard of equivocating on Proposition 100, saying he needs to take a stand on the ballot measure. Goddard also reiterated his stance on Prop. 100, saying he could not support the temporary one-cent sales tax increase that will go before voters on May 18 unless Brewer pledges to veto a bill that would cut corporate taxes by hundreds of millions of dollars. 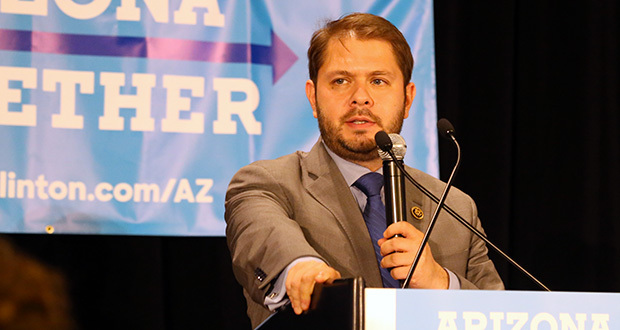 He said the bill, H2250, would provide tax breaks for corporations at the expense of middle-class Arizonans who would pay much of the increased sales tax. However, Goddard would not answer questions about what he thinks the state should do, or how it should make up the resulting fiscal shortfall, if Prop. 100 fails at the polls. “I don’t think it makes any sense to collect a tax from Arizona middle class and turn around and make it a corporate tax break. That is an exercise in folly. If we desperately need revenue, we better keep that revenue,” he said. Goddard’s primary focus was jobs, and he laid out the framework, though not the specific details, of his five-point plan for job creation. The plan calls for targeted tax credits and cuts for science-based, research-driven and renewable-energy industries. Goddard said wanted to create a statewide public-private entity to promote Arizona and attract jobs, similar to the Greater Phoenix Economic Council, which he helped establish as Phoenix mayor in the 1980s. “During this campaign I’m going to put my jobs plan out on how to get Arizona working. The details are coming, but the basic elements are very clear,” Goddard said. Goddard touted his record as attorney general, including his publicized battles against mortgage fraud, payday lenders, methamphetamine dealers and fraud against the elderly. But he most heavily spotlighted his efforts against Mexican drug cartels and human traffickers, citing a $94 million settlement his office reached in February with Western Union over money transfers used by cross-border drug traffickers. He said the money will go toward strengthening border enforcement in Arizona and other states. As governor, Goddard said he would increase pressure on the federal government to crack down on criminal activity on the border, including with the deployment of National Guard troops. He said expected to find a receptive ear in the Obama administration. “I know they’ll listen to me. We’ve already had some discussions, and we intend to have a lot more,” he said. The announcement marks Goddard’s third run for governor. After serving as mayor of Phoenix for much of the 1980s, Goddard narrowly lost to developer Fife Symington in 1990, and lost a three-way Democratic primary to grocery store magnate Eddie Basha in 1994.